The Apogee Preflight task processor performs the same task as the original Preflight task processor that used the Enfocus preflight engine. The new Apogee Preflight task processor is a standard component of Apogee Prepress. The original (Enfocus) Preflight task processor is a chargeable option. All customers who currently have the (Enfocus) Preflight will be able to continue to use it at no extra charge. The look of the parameter set is more expanded, compaired to the original Preflight. It contains filters and search engines that are easy to use. 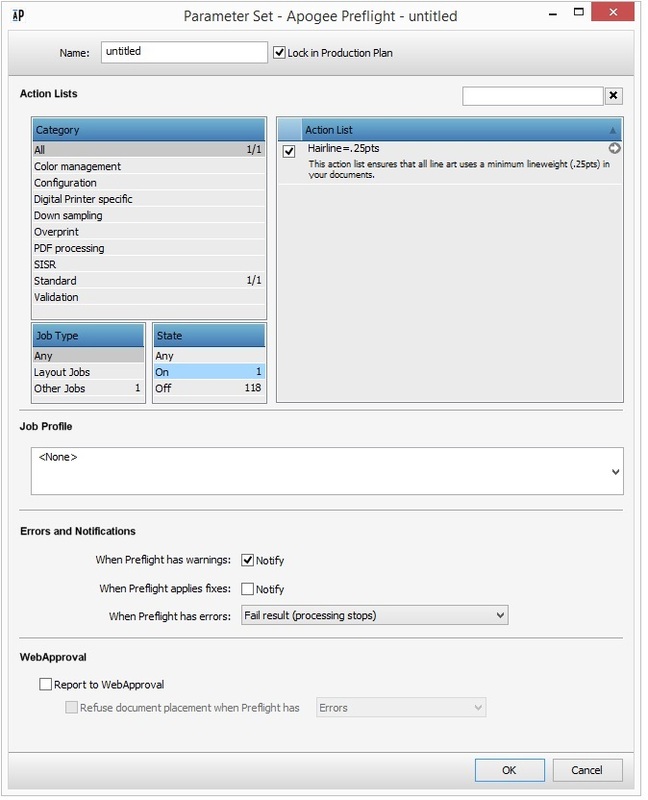 Using our years of experience handling PDF processing, we’ve created a preflight process that can go beyond standard profiling and actions. Most of the profiles and actions available in Apogee Preflight are based on what you’re used to using from the original Preflight. There are additional custom actions and profiles included on the Prepress installer DVD. A couple of notable ones remove transparency enabling easier PDF creation for digital presses and apply color settings, allowing export of color mapped PDFs.